What Day Of The Week Is December 12? 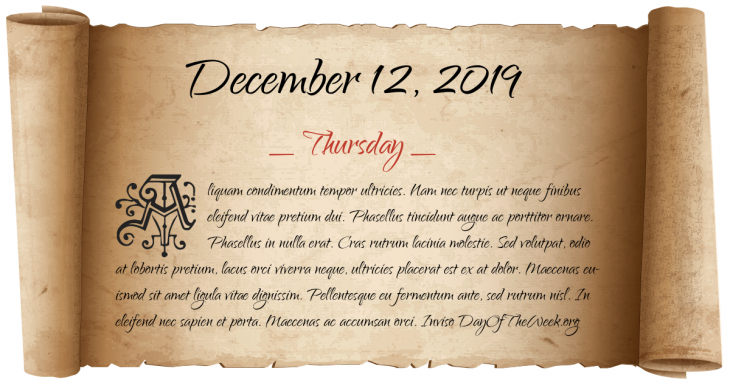 December 12, 2019 is the 346th day of the year 2019 in the Gregorian calendar. There are 19 days remaining until the end of the year. The day of the week is Thursday. The Majlis of Iran votes to crown Reza Khan as the new Shah of Persia. USS Panay incident: Japanese aircraft bomb and sink US gunboat USS Panay on the Yangtze River in China. HMS Duchess sinks after a collision with HMS Barham off the coast of Scotland with the loss of 124 men. A fire at a New York City ice plant spreads to a nearby tenement killing 37 people. Beginning of the Irish Republican Army’s “Border Campaign”. Women’s peace protest at Greenham Common – 30,000 women hold hands and form a human chain around the 14.5 km perimeter fence. Maaouiya Ould Sid'Ahmed Taya becomes the third president of Mauritania after a coup d'état against Mohamed Khouna Ould Haidalla while the latter is attending a summit. Arrow Air Flight 1285 crashes after takeoff in Gander, Newfoundland, killing 256, including 236 members of the United States Army’s 101st Airborne Division. The Clapham Junction rail crash kills thirty-five and injures hundreds after two collisions of three commuter trains – one of the worst train crashes in the United Kingdom. Who were born on December 12?